The big news this week was the passing of Stephen Covey. Covey has been massive influence on the world of self-improvement books and courses. His most famous book “The 7 Habits of Highly Effective People” is an international best-seller and has definitely helped me in my own personal development. I wanted to take this opportunity to share some of the most influential lessons I’ve learnt from his work. One of Covey’s biggest lessons is that of efficiency versus effectiveness. With a busy, non-stop lifestyle it can be easy to take the people around you for granted. While it is okay to be efficient (getting lots of things done quickly) with small tasks, when dealing with larger issues and those involving character and emotion, it is always better to focus on the most effective approach. Be efficient with things, be effective with people. We are all self-aware and just by taking a step-back every now again, we can assess ourselves, our habits and behaviours. Do our behaviours and habits match our goals in life? Are we really doing the right things to get to where we want to? Everything you do and produce in life must first be created clearly in your mind, before you can make it into a reality. So if your goal is to be leaner and healthier, you must first create that in your mind. Imagine how you look, feel and how the quality of life will improve if you reach your goal. Create a strong image in your mind and you will create a clear destination to aim for. With a clear destination your habits and character will align to help you get there. Sharpening the saw comes down doing the things that keep you at your best, so that when you do work you can be more effective. Eating a healthy diet, taking regular exercise and taking time to indulge in your favourite activities will help to keep you sharp. Whether that is watching your favourite sport, watching films or spending time with your family. Spending time doing the things you enjoy will re-energise you. A great way to detach from the day-to-day and help you to re-focus on what it most important in life to you. What are your outcomes for life? What are your outcomes for each project you get involved in? What are your outcomes for each relationship you form? Are you on the right path to meet these outcomes? What do you need to change? 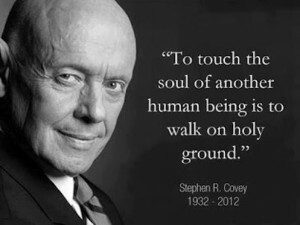 You can read more about Stephen Covey on the official website.